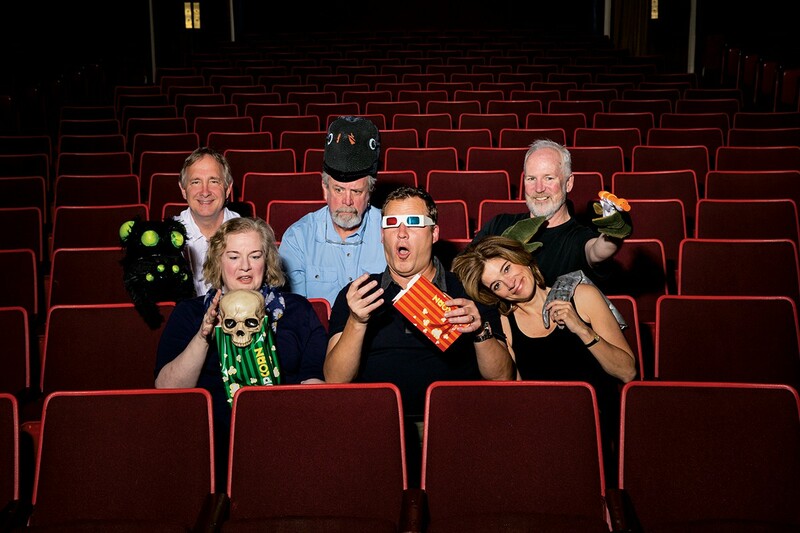 The “Mystery Science Theater 3000” cast is reunited. And it feels so good. It was somewhere in the fourth hour of my five-hour drive up to Minneapolis that I wondered to myself whether my apparently lifelong devotion to “Mystery Science Theater 3000” was worth it. But that was then. Now I’ve got a career, a wife, kids. I watch and write about the DVDs from time to time, and have headed to the local movie theater for a Rifftrax simulcast event from time to time, which is a lot of fun. But it’s not essential to me in the way it was 20 years ago. And yet still, I went to Minneapolis. And I’m so glad I did. The event will be rebroadcast in theaters on Tuesday, July 12, and if “Mystery Science Theater 3000” has meant anything at all to you over the years, I highly recommend you go. The show was billed as a reunion, featuring both original casts of the show in its Comedy Central and Syfy incarnations. And, as a bonus, Jonah Ray, the host of the new incarnation of “MST3K” coming this fall, would also be there. This all was a big deal. Since the show ended in 1998, one sensed a little bit of factionalism between some of the various members of the cast, although that seemed to have more to do with the business side of things rather than personal animosity. I remember Bill Corbett, the latter-day Crow, tweeting once that the Rifftrax guys got zero royalties whenever Shout! Factory put out a DVD set featuring their “MST3k” work. 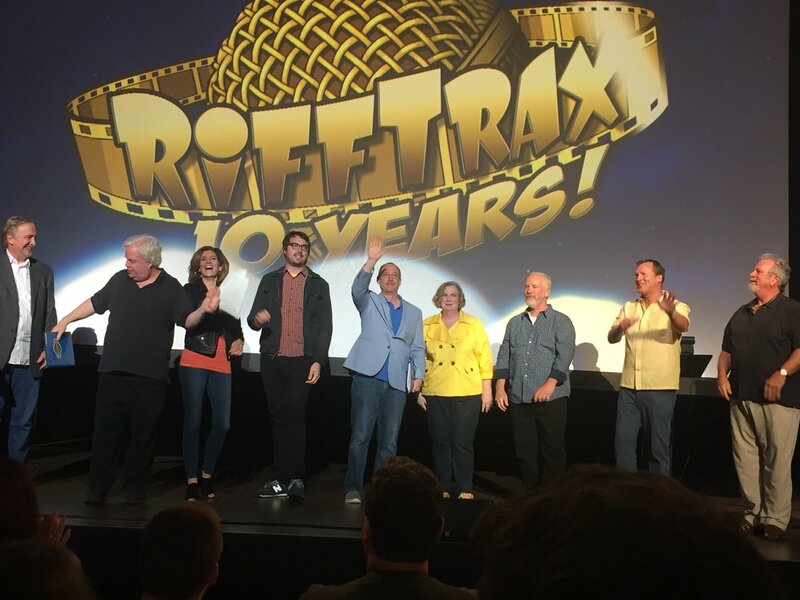 For years, the different factions moved on separate paths – the Rifftrax guys (Corbett, Michael J. Nelson and Kevin Murphy) built a thriving business for themselves, while the others pursued other projects, such as the Cinematic Titanic series and shows. But it felt like a turning point a couple of years ago when original host Joel Hodgson seemed ready to embrace his “MST3K” legacy again, appearing in the Shout! Factory “MST3k” Turkey Day livestream and starting a Kickstarter to fund the new show. The Rifftrax guys seemed to give their blessing to this, and the two promoted each others’ Kickstarters and otherwise seemed to make nice. It wasn’t like your divorced parents had gotten back together. But it was like they had met at your high school graduation after years of estrangement and actually gotten on pretty well. So, the Reunion show was a big deal. I was not surprised how funny the reunion show was. The two-hour show was cleverly structured with a series of shorts, and different combinations of cast members riffing together. After the Rifftrax guys took a turn, Mary Jo Pehl (best-dressed by far in a dynamite canary yellow jacket) and Bridget Nelson did a hilarious riff on a ‘50s promotional film, the kind that tells housewives all their marital problems will be solved with a new kitchen. Trace Beaulieu and Frank Conniff, the original Mads, did a very funny riff together, skirting the edge of working blue. And Hodgson brought out Ray to riff together, which was utterly delightful, like when Dad brings his son out fishing with his buddies and lets him try his first beer. Ray’s jokes definitely come from a younger sensibililty, with references to Lena Dunham and men cajoling women to “smile” that likely wouldn’t occur to the older guys. It was a ton of fun to watch these guys riff with an audience of over 2,000 diehard fans. In particular, “Shake Hands with Danger,” a ‘70s short about construction equipment safety, was downright raucous, with the audience laughing and shrieking together at each on-screen calamity like we were watching a horror movie together. But I was surprised by how moving the whole thing was, to see these comedians I had loved half my life get together on stage after so many years apart. “We like each other in real life” Corbett said as he shook Beaulieu’s hand (“Crow-on-Crow action,” Conniff quipped), and it was a joke, but it felt kind of true, at least in a no-hard-feelings sort of way. By and large, these guys seem like somewhat reserved, dry Midwestern types, the kind who would deflect a heartfelt compliment with a goofy joke. But there was a definite warmth on stage as they got together after so long. The one image I’ll always carry with me is of Ray, the young guy, wiping a tear from his eye as he took the stage to a standing ovation from the audience. Seriously, what “MST3K” fan hasn’t imagined himself in his shoes, riffing amongst giants? I was glad that he got such a warm reaction from the crowd, that he felt the love. Those are tough shoes to step into (he was great as a riffer), and as the makers of the new “Ghostbusters” found out, pop culture nerds can be very protective of “their” version of something. So it was nice to see that “MST3K” fans were excited and welcoming. As I said, it was a very special night, for reasons I did and did not expect. And the five-hour drive home the next morning just flew by.